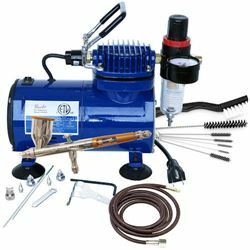 This kit combines the Paasche double action TG-3F, D500SR compressor, and AC-7 cleaning kit. The TG gravity feed airbrush is for airbrushers that require very fine detail spraying. The three spray head allow the airbrusher to spray almost any paint for most applications. The special fan aircap also allows for broader coverage of up to 3 inches. The compressor delivery 20-40 PSI depending in spray head being used.